Home HOME EXTERIORS Make Your Dream Home Complete With Excellent Patio Furniture! Do you have enough space in your backyard? You can get a wonderful look for your backyard with perfect patio furniture. It is the perfect place for you to relax and spend some time with your family happily. If you make it pleasant, you can have great time in your patio. 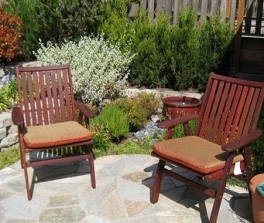 Comfortable patio furniture makes your backyard entertaining, memorable and also enjoyable. When it comes to outdoor or patio furniture, it is always a good idea to go for something that doesn’t require constant upkeep. An ideal patio furniture should be something that can be left out during any kind of weather and doesn’t rust or rot from moisture. It should also add perfect look and ambiance to your deck without making the place look cheap. You have to take special care while selecting furniture for your patio. Here are few tips that can help you while selecting patio furniture. Look at the empty space on your patio, deck or backyard [backyard ponds]. Now start to develop a vision of chairs, tables and benches that perfectly suits to your routine lifestyle in mind. Settle on your style and material that you want to use for your patio. In most cases, the material dictates the style of the furniture. So, be sure with the material. For instance, if you want a simple, substantial and traditional styling of English garden, you can choose teak material and enjoy the beauty and longevity offered by teak garden furniture – www.shackletonslifestyle.co.uk could give you a few ideas to start with! When you sit in the chair, you should get the feel of comfort and relaxation. The chairs should be movable; you pull them to the table as you would do for dining. Check the height of the table and chairs. Too high or too low won’t be conducive to get relaxation or entertainment that you desire. Patio furniture should be made with durable and best materials. As they are exposed to all kinds of climatic conditions, they should be capable to tolerate all kinds of weathers. So, it would be better for you if you get good warranty from the manufacturers. If you go for high quality patio furniture, obviously the manufacturer will offer you good warranty on the furniture. Try to go for best quality to get long-lasting results. When shopping for best patio furniture, check these quick tips and get efficient furniture for your patio or backyard. Previous articleSmart Ways To Decorate Your Outdoor Space! Next articleHow Solar Swimming Pool Heater Works?